My interest in jumping spiders (Salticidae) began in 1973, when I was an undergraduate in the Department of Zoology at Oregon State University. At the time, I was studying marine mollusks, based on an interest that began as an undergraduate in the College of Biological Sciences at the University of Minnesota. As I observed the many spiders that lived in the vicinity of Corvallis, Oregon, I was amazed at the diversity of lifestyles in this group of predators, but even more amazed by the fact that salticids turned to observe me whenever I watched them. div style="text-align: justify;">Nerve tracts in histological preparations, even those incorporating silver stains, are notoriously difficult to follow and to interpret. The lateral eye neuropile (lenp, above) that I found has not been described in other genera of salticids. 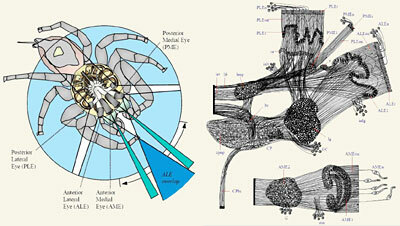 Even with a number of published studies related to eye structure over the years by A. D. Blest and his associates, very few studies of salticid neuroanatomy are available, and, given the enormous diversity of the family (perhaps 10,000 or more species worldwide), it is premature to draw any conclusions related to the generality and functionality of particular tracts. Very, very little in known about the structure of any spider CNS at this point. The enormous investment in visual systems by salticids is nonetheless remarkable, and more recent studies by other researchers have shown just how remarkable the optics and resolution of the AME can be. When you read the few published papers on the subject of AME resolution, however, you need to temper some of the conclusions with the fact that the eye structure of only a very few salticids has ever been examined. This is a very diverse family, and many differences between genera and species will be discovered in the future. Two things in my early studies really impressed me. First, the anatomy and histology of arthropods is really discrete when compared to that of molluscs, where connective tissues are freely intermingled with mucous glands and muscle fibers. Second was the fact that the structure of visual centers, as well as the two-layered central body at the rear of the "protocerebrum," is very patterned, even if we do not presently understand how these regular arrays of nerve fibers and encapsulated synapses really work. I have a lot of respect for the complexity and capability of invertebrate nervous systems. 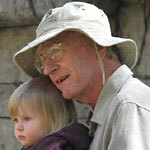 I left Oregon State University in 1975 to continue my studies at the University of Iowa, in the Department of Zoology. I went there to study arthropod neurophysiology with a professor who moved to a different university just before I arrived in Iowa City. Pretty much on my own at this point, my interests and related observations in the behavior of salticid spiders continued. I was fortunate enough to obtain support and access to the scanning electron microscope there, representing a fairly new technology. This allowed me to produce a variety of salticid anatomical studies, largely on cryofractured specimens, most of which I have not yet completed or published. More recently, I have been able to pull together old and new studies related to salticid feet (pretarsi), including some of this earlier work. The retractible, adhesive feet of jumping spiders are really remarkable, although they are probably not the only spiders with this capability. I left after one year to continue my studies of salticid behavior at the University of Florida, primarily because of the strong community of enthusiastic araneologists in Gainesville at that time. At Florida, I taught one course in genetics and population biology, and completed my dissertation on the subject of the "orientation" (memory of relative position and direction) of salticid spiders, focusing on larger salticids of the genus Phidippus. Field observations already made it clear that salticids, like many other arthropods, could run "detoured" routes (or pathways that deviate from a straight line to an objective). Indeed, they do this all day long as they move through vegetation. What I was interested in was how they could obtain and process useful information in order to do this, in three dimensional space. In reviewing some earlier published work on the subject of spider orientation, I learned the necessity of challenging, repeating, and validating earlier work and related assumptions. Many of the published "results" related to spider orientation simply could not be repeated, if only because it was physically impossible to construct the apparatus as described without presenting alternative sources of information to the spiders. Today, many published works related to spider behavior do not receive the scrutiny and repetition or analysis (with respect to alternative explanations) that they require for validation. Authors (with "authority") frequently write their hypotheses into headlined titles as if they were proven facts. Journals hide behind a facade of "peer review" which hides the fact that most "peers" just go along with the presentation. The general public would be more sceptical! I met Dr. Thomas Eisner at Florida, and I followed him to a postdoctoral position in Langmuir Laboratory at Cornell University in 1978. For one year, I taught a graduate seminar in arthropod orientation, and collaborated on a number of studies in chemical ecology and spider behavior, some of which have been published over the years. I published a rather abbreviated and unsatisfactory extract of my dissertation results at this time. After early setbacks, I stopped my pursuit of an academic career, and took a better position in business that allowed me to develop in areas of general management, technical engineering, operations development, systems engineering and development, sales development, and sales management. More recently, I have done some consulting in business operations, and some tutoring in mathematics and the sciences. As an avocation, I have been able to resume some studies of the Salticidae. For lack of equipment and university funding or facilities (I would certainly like to get access to a high-speed video camera! ), I am limited to field observations (still fascinating), development of theory, and critical reviews. I hope to do some meaningful behavioral experiments as well. Access to an increasingly sophisticated body of research in labs all over the world, and to open-minded people with related interests, through the Internet, has really opened things up. Many times, I have asked myself, just what makes salticid spiders so interesting? For me, it is still the visually-mediated behavior, the fact that these small creatures turn to face things (all kinds of things) in order to evaluate them, and the fact that their associated intelligence is so obvious. This is not to say that other spiders are not as intelligent, but the heavy reliance on high-resolution, binocular, trichromatic vision by salticids is easy for us primates to relate to. They are also very accessible in our neighborhoods, so we don't have to travel far. 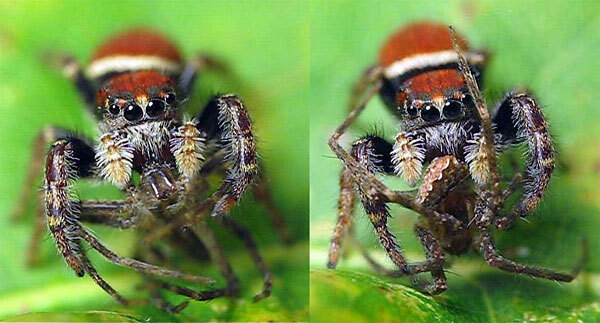 Two frames from video of female Phidippus cardinalis (Salticidae) feeding on a captured Pisaurina mira (Pisauridae). The Pisaurina actually had a larger leg span than the Phidippus, but the chelicerae of the Phidippus were much larger than those of the Pisaurina (left frame). The stocky Phidippus had the armament of a much larger spider, and this armament (the chelicerae) was itself heavily armored. I once watched a Phidippus princeps jump into the orb web of a much larger araneid spider to capture a struggling leafhopper, fight off the web owner with legs I (while holding the prey in its chelicerae), and finally cut itself free of the web to drop to the ground, still holding its prey. These bold spiders can behave as if they know the advantages that their vision, strength, and armament give them over other creatures. I have seen many "rare" behaviors, sometimes only once. Some of these are only seen in certain genera or species, but not in all. For example, some salticids can "dive" into water to escape a predator, and then crawl out and dry themselves. You won't see this very often. How large is the behavioral repertoire of these animals? Another area that is of great interest is the relationship of behavior to microhabitat selection. For example, some species, like Phidippus princeps, readily move from herbaceous plants into nearby trees. Others appear to avoid the trees, or prefer to be on or near the ground. Some ground-dwellers prefer fallen branches and logs to fallen leaves, for most of their rapid movement. Some salticid spiders have an even closer relationship to specific host plants, using specific plant structures for shelters, feeding from nectaries, or even feeding directly from leaves. There is much to be learned on this subject.